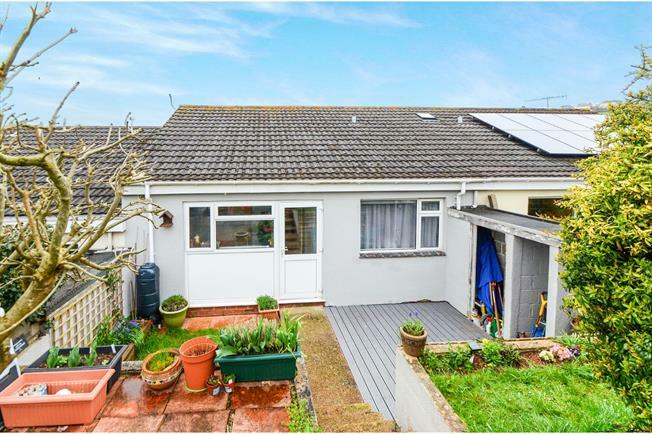 2 Bedroom Terraced Bungalow For Sale in Newton Abbot for Offers in excess of £180,000. Featured in the BIG OPEN HOUSE event Saturday 27th and Sunday 28th April please call for appointment times. A terrace bungalow in a sought after position within the village of Kingskerswell with good access to amenities and the A380. Comprising entrance porch, lounge, kitchen breakfast room, inner hall, two double bedrooms and a bathroom. To the front is a drive and integral garage. To the rear is a garden ideal for al-fresco dining that backs onto fields. The property also benefits from uPVC double glazing. UPVC double glazed door. Double glazed uPVC window with obscure glass facing the front and side. Double glazed uPVC window facing the front overlooking fields and the village Original coving. UPVC double glazed door opening onto the garden. Double glazed uPVC window facing the rear overlooking fields. Original floorboards. Wood work surface, fitted wall and base units, stainless steel sink, electric oven, over hob extractor, space for washing machine. Double glazed uPVC window facing the front overlooking fields and the village. Double glazed uPVC window overlooking fields. Picture rail. Tiled flooring, part tiled walls. Low level WC, panelled bath with shower over, pedestal sink. Driveway with parking leads to the garage. Lawn garden to the side. Steps to the front door. To the rear the garden is on two levels with deck and lawn garden with steps leading to a small patio area. There is access across the neighbours garden to the rear and the garden backs onto fields.